If life feels like a constant struggle and you’re ready to ditch old habits that no longer serve you, then join me for a dynamic, uplifting yoga class and get the practical tools to kickstart a life full of peace, purpose and joy! Come have an experience of your authentic Self! Each class is a workout for your physical and spiritual self, blending pranayam (breath control), a kriya (yoga set), sweet relaxation, deep meditation and powerful mantra (sacred sound). 1. Purchase a class pass. 2. Let us know which classes you plan to attend! This is an intimate class taught at Pawan's home studio with a 10-person maximum. To guarantee your spot, click the RSVP button below, and we'll message you the address. As long as you've pre-paid, you can commit to as many classes as you'd like (eg. I would like to attend the next 8 classes). Unfortunately, we cannot guarantee spaces for those who do not RSVP. There is a 24-hour cancellation policy to give us time to fill the class last-minute. Kundalini yoga is a sacred technology that is designed to give you an experience of your soul. With regular practice of this raj yog or yoga of awareness, you will begin to access the truth of who you are, your Atman, which will help you understand your true purpose on this planet. This powerful yogic tradition is thousands of years old yet perfectly suited for today’s world. Kundalini yoga offers the skills needed to successfully cope with the challenges of our times. It is perfect for those of us dealing with the day-to-day stresses of long commutes and demanding jobs, being in partnership, or raising families while trying to stay aligned with our purpose. Allows you to quiet your mind and hear your inner guide. Clears the subconscious of past stories that are keeping you stuck. Strengthens the nervous system, expands lung capacity and purifies the blood to keep your body healthy. Alleviates stress and brings balance to the mind, body and spirit so you can experience true happiness. Strengthens your aura so you're not affected by the negative energy of those around you. Kundalini is a Sanskrit word that means coiled, and refers to the dormant energy that resides, usually unnoticed, at the base of your spine. We could call this your untapped potential, your Atman’s shakti or soul power. The incredible technology of Kundalini Yoga is designed to bring about the awakening and release of this energy so you can connect to your highest self, your Sat Nam (True Identity). The earliest mention of Kundalini Yoga was in the Upanishads, a sacred Vedic collection of writings (c. 1,000 B.C.–500 B.C.). Historical records indicate that Kundalini was a science of energy and spiritual philosophy before the physical practice was developed. From its origin, the science of Kundalini Yoga was kept hidden. It was treated as an advanced education and passed on by oral tradition only from master to a chosen disciple. Teaching Kundalini outside the secret society of Indian yoga elite was unheard of. It was believed that the public was not prepared to access such powerful knowledge. It was never taught openly until 1969 when Yogi Bhajan took a one-way flight from Punjab, India to Toronto, Canada. He brought Kundalini yoga to the West and began teaching publicly. At 27, I found myself walking aimlessly in Kitsilano trying to figure out the mess that had become my life. I ended up at a beautiful yoga studio called Yoga West. Out of curiosity, I took my first Kundalini yoga class that day. Immediately after that class, I signed up for teacher training. The universe put me on my path and I’m so grateful I had the awareness to see that. 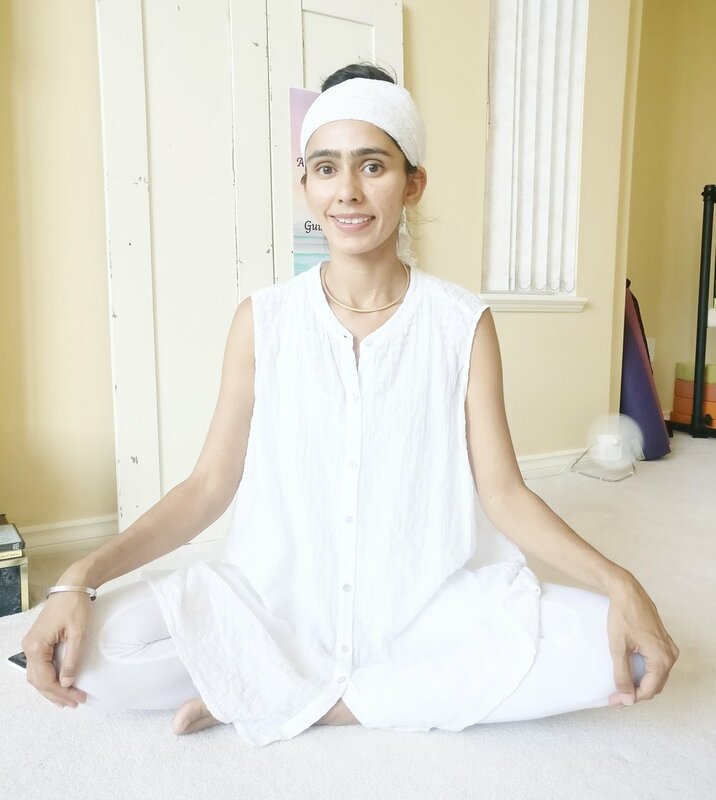 I have experienced first-hand how Kundalini yoga can change your life in the best possible way, which is why I’m committed to sharing these teachings. I bring a unique east-west perspective to my classes where I share the Indian wisdom passed on to me by my mother, and the insights I've gained from life in the West.